After long 9 years later ,today, my mind went to those days where I was come out of school to join junior college education.I still remember that day when I come out of college gate as a student of very strict reputation holder Reubai Balaji Deokar Vidyalay,which was 2 kilometres away from my home at Wadgaon Aanand near my town Alephata (Pune). I felt like I just come out of 5 years of prisonment.I felt like I won over something that not everyone wish to just tackle it. My face was wide open with grace of joy. One of my friend was crying and got emotional so much.I never forgot his face. I was really very surprise to see some of the girls was also crying in emotion of missing those days. haha.... I never thought that time that girls will cry for this reason. But as these thing come into my mind then I differentiate these two types of tendancies after leaving school.Someone deeply attached to school ,but my 11 friends and me not at all. If I closely think about my college as a mature person then I consider myself as very lucky one who get school like this. Some friends in my colony not taken admission to this school because of strict policies of this school.As a result there was only 79 students when I passed out of school. Now I think that why not all the students from Maharashtra are lucky enough to have such great school. The kind of education I acquie was just phenomenal,also I never forgot about strickness,desciplines that my school have maintained .Because it that descipline came into my life as well and I am really glad to follow those desciplines. One of the most important thing I learned from my school is that how to fight with the hardest situation by applying best you have. I remember every day was just hard day for me. I was scared by the teacher's punishment all the time.But this leads to what I now most proud of my school.it gave me dedication towards only your target,that's it. My schools days 24 hours are planned. From morning to night.I was doing what I have to do. I mention one of the major quality about my school is that the kind of english I learned. I remember portion of english since from class 7 .Total english grammar was covered upto class 10 in class 7. What kind of heavy load was that.It was not on us but also on my teacher Mr.Khade sir. I am really thankful to him about his efforts. And Mrs.Kurhade madam was just like 'dronacharya' to me. She was teacher for english for class 9th and 10th. I never forgot spelling of each word in my english book up class ten.I will bet on it. She worked hard on my class.As a result guys those failed in 10th can speak in english not fluently but very well. These thing I remember a lot. because it affect my life positively. My school have produced very talented, scolar and most importantly successful people in thier respective career.I am really thankful to efforts taken by my school teacher. But I still feel scared when I goes to that days. 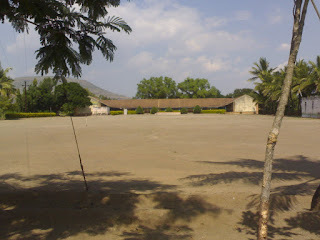 There is lot of to write about my school.But it is not possible to write on blog.